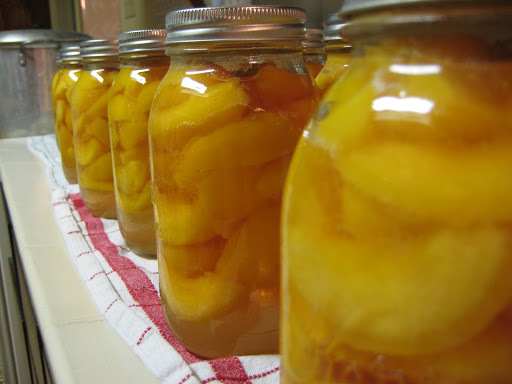 Isaac went through all of the peaches and pears that I bottled last year by about May or June. This year I figured we should triple what we did last year to keep up with what the boys eat around here. We bought 4 bushels of peaches and 4 bushels of pears. My mom came Friday and Saturday before Labor Day to do pears (104 jars). 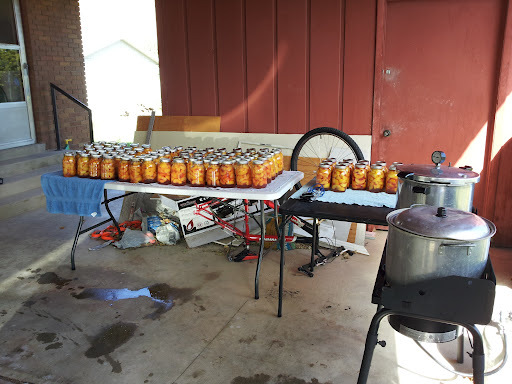 Here is a shot of all of the peaches (118 jars) we did. My mom, Derek’s mom and dad and I spent about 7 hours on Labor Day to accomplish this great feat. Derek was super dad all weekend. He got to feed, clothe and tend all the boys for those three days. (Plus he did all of the laundry!) He’s pretty amazing. It was lots of work and I hope that we never have to do that many again! I’m banking on the fact that they will eat a better variety of things this time next year…. Thank you, thank you again moms and dads for your help! Today I took all three boys to the grocery store without my husband!! I’ve only taken the kids to like two other public places without any help. I usually run all of my errands on the weekend when Derek isn’t working or during nap time (usually only quick jaunts to Walmart) while Derek is working with the baby monitor next to him or I find someone to watch one or two of the boys. Anyway, I didn’t make it to the store this weekend and so this morning I talked myself into being brave. 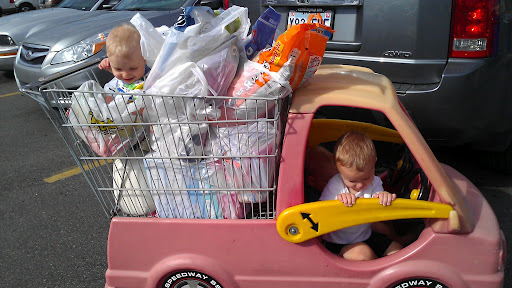 At Macey’s they have those shopping carts that look like cars and some of them fit 3 kiddos. 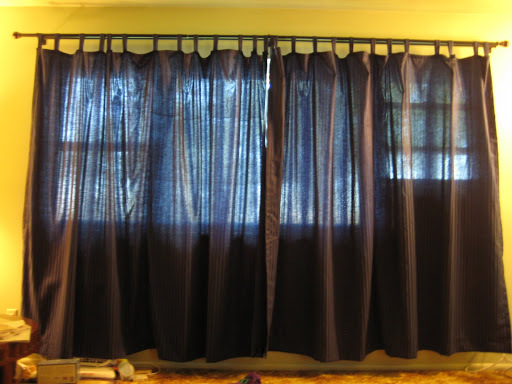 Perfect for three little boys. (Don’t worry, I’ve had them scoped out for many months). I prayed all morning that there would be one left in the parking lot so that I could load them easily in relative privacy and that I would have a way to get all the kids inside. After driving around the parking lot for a minute, I saw that my prayer was answered! There was one way out by itself just waiting for us. Phew!